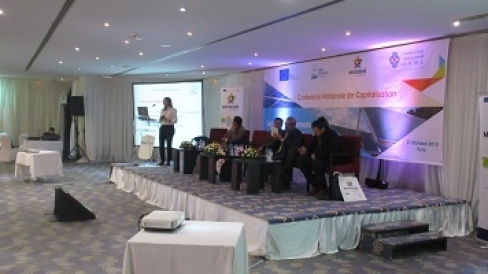 In the framework of MED-DESIRE project, the National Agency for Energy Conservation-ANME organized in Tunis on October 27th, 2015 a national capitalization conference entitled “Market Promotional Tools for Distributed Solar Technologies”. The event have seen the participation of more than one hundred representatives from relevant public organisations of energy and finance, municipalities, as well as private organisations from the banking sector and SMEs operating in the field of solar energy and building sector. The national event was structured in two sessions. During the first one, the MED-DESIRE project, the Tunisian energy context and the new regulatory framework for electricity production from renewable energies were presented. Then, the stimulation tools to spread energy efficiency and distributed solar energy technologies for Tunisia and the new innovative financial mechanism, undertaken in the framework of the MED DESIRE project, were detailed. Finally, a successful experience of a local bank in financing energy conservation projects was showcased. In the second session, panellists of the round table conference discussed the implementation of the proposed stimulation tools, solar ordinance and the new innovative financial mechanism, to remove barriers of the local solar market development. The attendees and panellists interactions were focused on the contribution of the banking sector and SOTUGAR in the development of energy conservation projects and the collaboration between stakeholders to implement that kind of initiative, consisting of promoting tools for distributed solar technologies.